This is the best discount that i've ever seen published for Military Members. A standard Sam's Club membship costs $45. 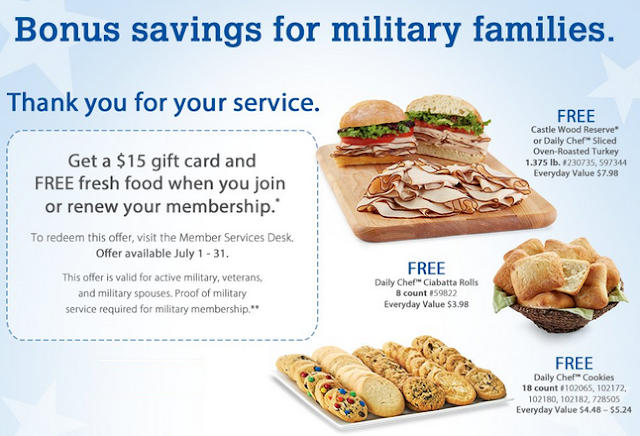 Military Members normally get a $15 gift card with new memberships or renewals. For the entire month of July (July 1- July 31) you get a $15 gift card AND $15 worth of food (Sliced Turkey, Cookies, and Rolls). The cost of membership is normally $45 so this brings the cost of membership down to around $15. People considering a Sam's Club Membership - this deal is average. Sam's club has had very similiar offers on Zulily and Groupon recently. Those are now expired so if you are looking for a membership today this is definitely the best deal around right now. Current Sam's Club Members - This is an AWESOME deal for people who are already Sams Club Members and were thinking of renewing. Those other deals on groupon and zulily only apply to new members, NOT renewals. You won't find a better renewal deal at Sam's Club than this. How much is the Discount? You get a $15 Sam's Club Gift Card + Vouchers for FREE Food. Once you get to the store, go to the member service desk and tell them you would like to sign up for a membership and show them your military ID. Thanks Maximizing Money for pointing out this discount! Check out his site for a ton of non-military discounts!! Want to find out more about Costco's and BJ's Military Discount?